Our Kathy - Moruya Antique Tractor & Machinery Assoc. Inc.
Our Kathy Shields and Rotary's Keith Armstrong. 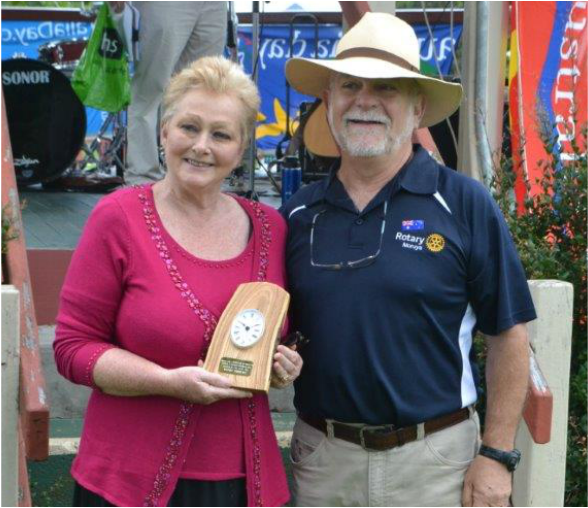 Moruya Rotary Club President, Keith Armstrong described Kathy as a tireless and dedicated volunteer. "Her service as a presenter has contributed greatly to the Community" he said. "Nothing is ever too much trouble for Kathy and she is always willing to help out wherever she can". She has also severed on several Management Committees at EAR Inc as Vice- President and is currently their Secretary. Kathy's work in the community has gone far beyond the airwaves. She has served as Secretary of the Moruya & District Red Cross from 2007 to 2014 and has been a valuable member and supporter of the Far South Coast Lantern Club, whose work supports the Royal Institute for Deaf & Blind Children. She is also an active member of the Moruya Antique Tractor & Machinery Association Inc , has served as Publicity Officer, Assistant Treasurer and is currently their Treasurer. Kathy said it is humbling to receive the award. "You do things because you love to do them" she said. "To be recognised for that is a bonus" ... "It is a great community and I am happy to be a part of it." She praised the Moruya Lions and Rotary Clubs for having faith in what she does. "To have ones 'work and passion' acknowledged in the form of an award, by two such respected groups as the Lions and Rotary within our Community is indeed an honour"
All MATAMA members should be very proud of 'Our Kathy"
for her achievements both within our club and within our community.